Right on cue, the Oculus Rift team have unveiled the new and improved version of their virtual reality headset – and it's a significant step forward. 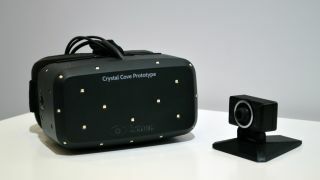 The new prototype is going by the name of "Crystal Cove" and adds positional tracking, improved latency and lower persistence with a new 1080p OLED display. That new OLED display replaces the LCD of previous iterations, offering a new low-persistence screen to eliminate motion blur. In fact, overall latency has been reduced from 60 milliseconds to 30 which should go a long way to reduce motion sickness, although the team will be aiming to get it even lower. The new Rift also offers positional tracking, something it achieves by pairing with an external camera that tracks IR dots on the headset. This means you'll be able to actually move your head in the virtual world and do cool stuff like look around corners. The extra bit of hardware will come bundled with the Rift when it hits the market. Oculus Rift is currently heading for a release towards the end of this year, and we're pleased to see that the new prototype is almost at the finish line.